In the official Xbox One release yesterday (2013/5/21), it is mentioned that the new Kinect sensor employs a time-of-flight camera to acquire depth image instead of using the Light Coding technology from the original Kinect (which is patented by PrimeSense). It amazed me because I heard about how expensive a time-of-flight camera is: SwissRanger 4000 (a popular choice in academic research) with 176x144 resolution at 50 FPS costs more than $4,000. So I started digging and found how ignorant I am to the recent development of the field. Let's venture deeper into the hardware. Thanks for WIRED Magazine's exclusive report, we can see the performance and internals of the new Kinect sensor. 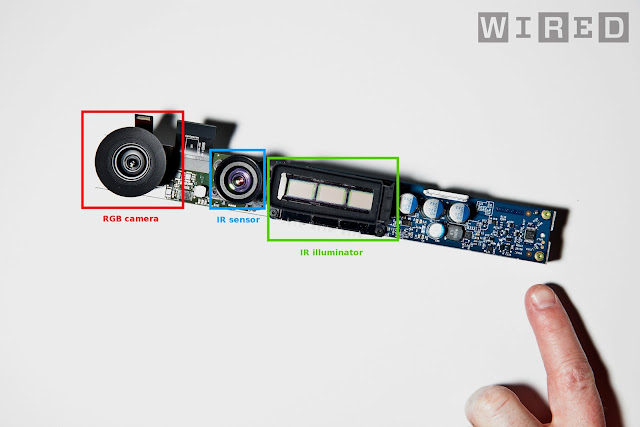 We can see from the picture of the circuit board that the three crucial components, RGB camera, infrared (IR) sensor, and IR illuminator, not unlike the original Kinect except that the IR sensor and illuminator are no longer exposed. Photo of an original Kinect sensor with components labeled. Thus the IR sensor and RGB camera are still separated (also confirmed by the different field of view when switching between the two streams in the WIRED video: http://youtu.be/Hi5kMNfgDS4?t=5m27s). If the sensor can capture both RGB and IR simultaneously from the same sensor (or just switching quickly between the two at 60Hz/60Hz or 30Hz/30Hz), texture mapping alignment in KinectFusion type of application would get better. In case you wonder, the reason why I argue that the IR illuminator is the big rectangular block to the left of the IR sensor (instead of the other way around) is because the active IR image shows shadow due to IR illumination on the left but the screen we see is a mirror image: http://youtu.be/Hi5kMNfgDS4?t=5m8s. This shows that the IR illuminator is on the left to the IR sensor (which by the way should have a lens like the exposed RGB camera). Comparing to the original Kinect, the most noticeable improvement of the new Kinect is the almost shadow-less depth image (see video http://youtu.be/Hi5kMNfgDS4?t=37s) due to the closer placement of IR sensor and illuminator. In fact, TOF technology allows for more flexibility with the illumination placement and design (thus better depth image). For comparison, google "kinect shadow" and take a look at the images. Looking forward, the natural question to ask is when will depth sensing technology go mobile? Canesta seems to have some prototype for product can fit into the form factor of a phone: https://www.youtube.com/watch?v=5_PVx1NbUZQ and the video is two years old. 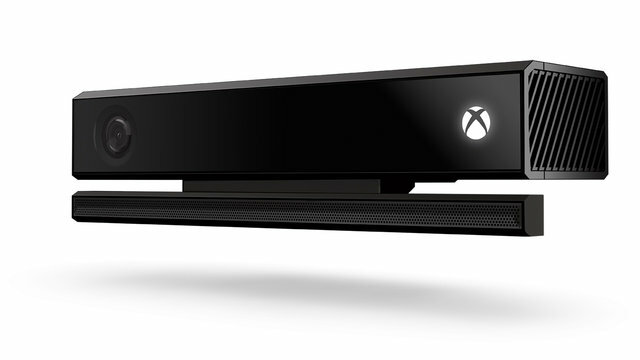 The trail that led to this new design of Kinect sensor is clear in retrospect. Microsoft acquired 3DV Systems and Canesta a few years ago which have both worked on TOF technologies extensively. The acquisitions obviously clear up some patent concerns for Microsoft (Bye, PrimeSense...). The down side is that we, as developers and consumers, might not see a more open-source friendly alternative with similar technology anytime soon. And we would have to rely on Microsoft to release good SDK and live with Windows when using the new Kinect in commercial applications.